Google is all about making normal things we do more easy via our smartphones and Google Search. 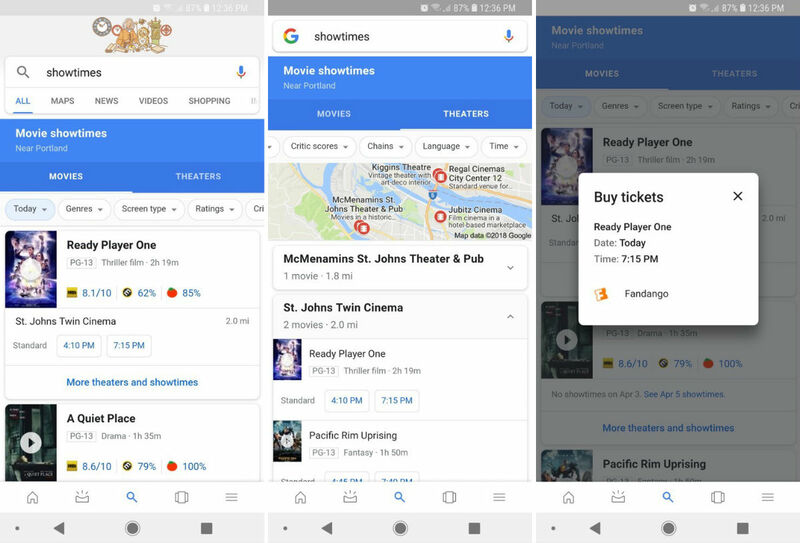 This week, the company is introducing slight changes to the way we go about looking up movies and showtimes inside of Google Search. Moving forward, whenever you search for “showtimes” or “movies,” you’ll see a list of Movie Showtimes. From here, you can now filter your searches based on the date, genre, screen type (IMAX, 3D, etc. ), ratings, critic scores, theater chains, language, and time. Furthermore, you can look at specific theaters near you. When this tab is selected, you’ll be shown all of the theaters around you, plus how many movies they are showing. Once a theater is chosen, you can choose which movie and which showtime, then of course, are offered a link directly to Fandango for ticket purchasing. It’s a pretty streamlined experience, and come to think of it, I should probably go see Ready Player One.